The trouble with predictions about the future of food is that they usually wind up being wrong. Where, for instance, is the dog-sized cow engineered to graze in my backyard? Meals today don’t come in pill form, and despite decades of anticipation, insects haven’t replaced farm animals as a meaningful source of protein. You’ll understand why I’ve approached the question of how we’ll shop for food in the year 2069 with some amount of hesitancy. To find my footing, I called Max Elder at the Institute for the Future, a think tank based in Palo Alto, California. Elder works as a researcher in the Food Futures Lab, which companies and governments hire to do exactly the type of blue-sky thinking that conjures up an idea like that backyard cow—or, in this particular case, blenders and refrigerators that can conspire to manipulate commodity markets. Whether or not these concepts bear out, Elder tells me, he believes that engaging in such speculation is critical to shaping our world. Fail to dream about the future, and you forfeit your role in its creation. Today, the grocery store is in a period of particularly rapid change, as more and more companies vie for their share of America’s $650 billion food retail sector. Legacy supermarket chains like Kroger and Albertsons are now up against discount rivals like Walmart and Costco, European transplants Aldi and Lidl, plus drugstores, dollar stores, and, of course Amazon, which has been steadily encroaching on food retail since its 2017 acquisition of Whole Foods. All that competition has produced a climate of innovation, as retailers try to beat each other on exclusive products and services, value, technology, and convenience. The choices they make matter: Everybody eats, after all, and what we consume is determined to a large extent by what our grocery stores decide to offer. In forecasting where the industry will go over the next few decades, Elder told me, “The idea is to push people beyond notions of what’s plausible to what’s possible. What are the values implicit in the question? What will the food system look like if we optimize for different values?” He encouraged me to think of it all not so much as predictions but imaginings. So, I decided to suspend disbelief, loosen my grip on reality, and imagine a world where T-bone steaks grow on trees (or at least in bioreactors), snacks are tailored to my microbiome, and my morning coffee arrives by drone. Saddle up, everyone! Don’t forget your decoder rings. I figure a good place to start thinking about the supermarket of the future is a supermarket of the present, so I arrange to meet with Fabio Parasecoli, a professor in NYU’s Department of Nutrition and Food Studies, at his local Whole Foods, in downtown Manhattan. Parasecoli, a genial man with close-cropped hair and a lingering accent of his native Rome, has been thinking a lot about food and where it’s headed: He recently completed work on a layperson’s guide to the food system for MIT Press and is in the midst of consulting with the Victoria and Albert Museum in London on its upcoming exhibition dealing with the future of food. Over coffees at the store’s Allegro Coffee Bar, I tell Parasecoli that it seems to me the whole supermarket paradigm will go the way of the dodo bird: Instacart, the grocery delivery service, raised more than $1 billion in 2018 to fuel expansion, and now Amazon is reportedly gearing up to bring its two-hour delivery service, Prime Now, to nearly all Whole Foods stores in the United States. I will never bet against the inherent laziness of humanity, and as more and more consumers are able to do their weekly shop without ever getting off the couch, it seems to me that nobody will continue to put up with the hassle of visiting an actual store. Parasecoli disagrees. He sees the brick-and-mortar grocery store sticking around but moving toward something that functions more like a community hub. “Look around you,” he says. In addition to this spacious café, the store includes a vast prepared-food section and a second level designed as a sort of food court, with stand-alone barbecue, burger, and salad kiosks. In square-footage terms, this Whole Foods is already more of a restaurant than a grocery store. Imagine merchandising in the style of an Apple store: one pristine sample item on display that can be scanned and instantaneously fulfilled from a chilled subterranean stockroom. As we enter the fresh produce section, Parasecoli gestures at a display of apples. Instead of the conventional trio of Granny Smith, Golden Delicious, and Red Delicious, there are at least dozen options. Over by the potatoes, in addition to Yukon Golds and Russets, there’s a purple variety that I haven’t seen before. 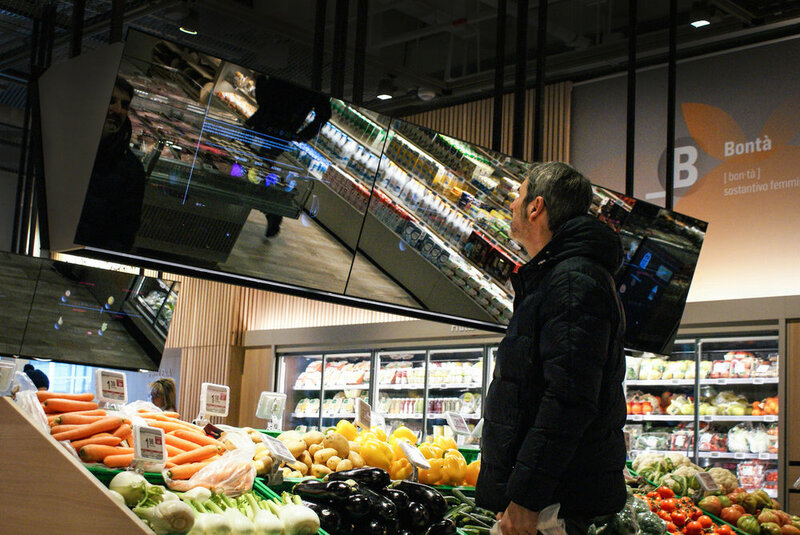 “The more cutting-edge supermarkets will distinguish themselves by offering more agrobiodiversity,” Parasecoli explains, and then considers whether displaying mounds of fruits and vegetables will continue to appeal to shoppers who are increasingly concerned with freshness and food waste. Imagine instead merchandising in the style of an Apple store: one pristine sample item on display that can be scanned and instantaneously fulfilled from a chilled subterranean stockroom. Nearby, a wall of plastic water bottles catch Parasecoli’s eye; in the future, these won’t fly with the Whole Foods set. Just as Styrofoam has fallen out of favor, plastics will increasingly be replaced with reusable containers and biodegradable alternatives. Parasecoli is doing what futurists call “amplifying weak signals” — looking at points of data in the present and extrapolating to their logical conclusions. That’s the same approach used by Mike Lee of the Future Market, a project that explores how we’ll produce and shop for food in the future. Lee, who works in food product design, observed that the automobile industry spends big to produce wildly futuristic concept cars and wondered why the food industry wasn’t investing in the same way. The Future Market’s upcoming pop-up concept store, which will be on display at the Winter Fancy Food Show in San Francisco, focuses on the future of biodiversity and sustainability in the grocery industry. Lee thinks digital grocery shopping is likely to experience massive growth in the coming years but that the picture changes further down the line. “That’s more of a 10-to-15-year thing,” Lee says. Already, British grocer Ocado has come close to achieving a fully autonomous grocery warehouse; at a new fulfillment center in Andover, England, a fleet of robots that look like a cross between postal boxes and Pixar’s Wall-E glide across a metal grid, retrieving items from thousands of bins located below them to package into orders for delivery. Ocado plans to license its technology to grocers around the world, removing the human labor that powers a costly grocery delivery service like Instacart. Like Parasecoli, Lee believes physical grocery stores will persist in a variety of sizes, shapes, and formats. People still like to touch, see, and smell certain items, like fresh produce and fish, and we still visit grocery stores to source prepared items, like rotisserie chickens and heat-and-eat sides, just in time for dinner. Grocers have a strong incentive to make their stores appealing: Customers spend more when they shop in a store than online. “In a world where you can get anything at a push of a button, grocers will need to be more creative.” Lee says. In China, internet giant Alibaba has begun to expand offline with its Hema brand of superstores, where visitors can pick out live seafood and have it cooked in front of them at an interactive food court. At the Whole Foods I visited with Parasecoli, we saw employees stationed in front of glowing Wood Stone ovens, where grab-and-go items like pizza and sandwiches could be warmed to order. On-site food production isn’t a new idea, but in the next half-century, that could extend from preparing meals to fashioning the ingredients themselves. Lab-grown meat is moving closer to becoming a commercial reality; Lee says a grocery store might have meat bioreactors in the basement and hydroponic growing facilities on the roof that generate fruits and vegetables for the store while capturing rainwater and offsetting the store’s carbon emissions. A system like that would be environmentally efficient while appealing to consumers’ interest in traceability and freshness. But the aspect of our food future that most interests Lee — and Max Elder— is the emergence of a food system where, as Elder puts it, “consumers become more than just a mouth at the end of a supply chain.” As each of us cast off more and more information about our needs and habits — from biometric data produced by wearable and ingestible sensors to our online footprint to smart refrigerators that know which staples are running low — food producers and sellers will be able to figure out what you want and need before you know it yourself. At the same time, new production technology, from 3D printing to hydroponic growing to cell-cultured meat, will make it easier to create food products personalized to the individual consumer. Plug all of that together and you end up with a hand-in-glove food system: an ever-tightening feedback loop between the sellers of food and consumers. The steak I buy for dinner could be grown exactly to my calorie needs and preferred protein-to-fat ratio, plus extra iron to nip that slight anemia in the bud — and made just in time, based on my eating patterns. Nifty as all this might be, these projections seem to ignore other, less palatable signals pointing toward darker features of our food destiny. For instance: the increasingly unequal distribution of wealth in the United States, which has resulted in more and more polarized shopping and eating habits. Despite the widely acknowledged growth of the market for natural and organic foods, Americans today spend more money on groceries at dollar stores than at Whole Foods. Visions of our food future invariably imply a specific type of well-off, technologically fluent consumer. What’s to become of everyone else? Everyone I spoke with for this story agreed that eating animals — fish or meat, wild or farmed — will likely become a privilege reserved for the rich. Recent climate reports suggest that, absent unprecedented interventions, large parts of the world will become unusable for food production, intensifying food shortages, poverty, and migration. Wild seafood will become scarce, if not absent entirely. Exactly who suffers, how much, and how soon is up for debate, but the overall direction of this shift is not. For instance, everyone I spoke with for this story agreed that eating animals — fish or meat, wild or farmed — will likely become a privilege reserved for the rich. Perhaps plant-based and cell-cultured meats will advance enough to fill the void, producing substitutes that are both delicious and efficient. But I wonder: What, exactly, will bargain-basement cell-cultured chicken look like? Elder agrees that today’s food system doesn’t work for everyone. “It’s been imagined and planned and implemented by people who optimize food for shareholders, not stakeholders,” he explains, with a note of bitterness. If those same forces shape the future, we may as well prepare ourselves for islands of bounty surrounded by expanding food swamps and deserts.